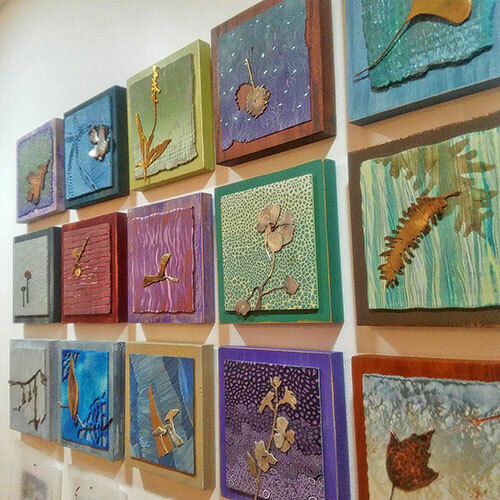 Maryland’s Margaret Polcawich took on a 30-day challenge to create a wall of 6″x6″ pieces to be displayed at the Spitzer Art Center in Harrisonburg, VA. 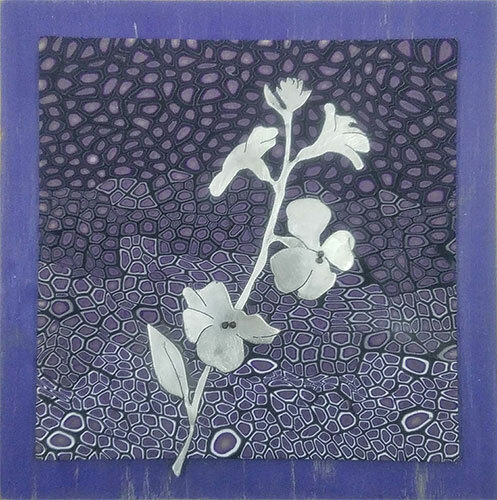 The squares feature a metal flower or leaf cutout layered on a patterned polymer background mounted on a painted wood frame. Now that she looks over the first 15 works shown here, Margaret says that she prefers the ones that weren’t finished at 2:00 a.m. (You can sympathize, right?) Examine them all on Facebook. Impressive and almost makes you want to take on a challenge now that it’s a new month! Thanks for all the birthday wishes yesterday. I’m Facebook-challenged and the list of well-wishers that popped up surprised and delighted!